Highlights in this issue include a conversation with Dr Donough Wilson and insights into airborne base stations and datacomms. 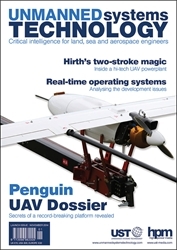 Dossiers on the Hirth S1218 two-stroke twin, the UAV Factory Penguin C and the ASV Enduro-C as well as focus articles covering real-time operating systems and composites. Click 'Details' for full contents.